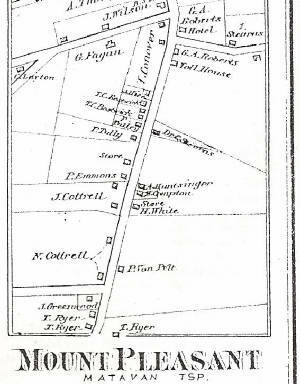 In 1835 Freneau's wife and daughter sold the homestead (now down to 32 and a half acres) to Nicholas Cottrell. It then passed hands into the possession of Captain Garret Hiers, a sea captain in Middletown Point. In 1843 Hiers sold the property (now down to 16 and a half acres) called the "Leadbeater lot or near Mount Pleasant" to the first of the subsequent "gentlemen farmer" owners from New York- Thomas Ryer. Thomas Ryer (and later his son James) would aquire much more land, building the farm (that James would name "The Magnolia Farm") back up into hundreds of acres. The Ryer family remained prominent in Matawan for almost 70 years. Thomas Ryer's great-great-great-grandfather, Michiel Bastiaensen van Kortright, emigrated from the Netherlands to Harlem in 1663. Thomas Ryer was born to William Ryer around 1808 in Fordham, N.Y.
Thomas was a businessman in New York when he bought the property in 1843 for $1000 and moved this family to my house. He continued his business in the city eventually bringing his sons into it with him. Over the next ~30 years, Thomas Sr. would build the farm back up to over 100 acres buying land 16 times in Matawan and Marlboro. 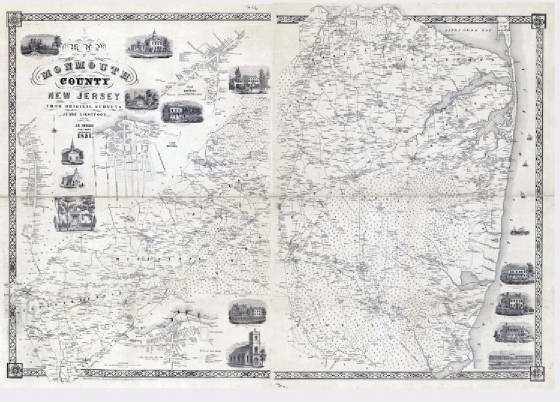 The first wall map of Monmouth County, surveyed by Jesse Lightfoot, was actually published by J.B. Shields in Matawan (Middletown Point). 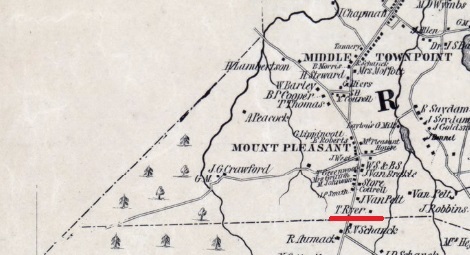 This close up of the Mount Pleasant area shows T. Ryer at the location of the house (underlined in Red), and J. Van Pelt the closest neighbor. Albert S. Ryer 5, Robert Ryer 2, and John Stryker 24 a farm hand. The Ryer's did business in the Washington Market in New York. In particular the West Washington market that focused on the fruit trade. Below is an add from the NYT in 1859 showing Ryer in business with fellow Matawan resident Schanck selling fruit and ornamental trees. Magnolia Farm had orchards from the earliest time being mentioned in the original Peter Watson will to his wife. The West Washington Market must have been a popular one for Matawan farmers who would have transported their produce via steamship. 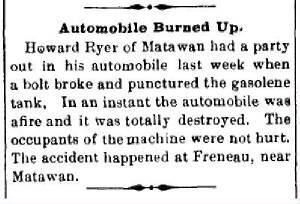 In 1860 there was a large fire at the market and in addition to Ryer, other Matawan names such as Van Pelt, Conover, and Lloyd are listed as having been "burned out". The 1860 census shows the addition of an Adeline Ryer- wife of David who at 25 was still at home; and Denise and Catherine Sweeny as farm hand and servant. James B, who would have been 19, is not listed at this time. Ryer, T & W & Co (Thomas & William & David G Ryer) 134 W Wash. Mkt. In 1870 the household is down to Thomas senior and Mary, Thomas junior, Louisa- his wife, Nathaniel King- farm hand, Catherine Fritz- domestic. Also living in the house is Dr. Frank Travers. 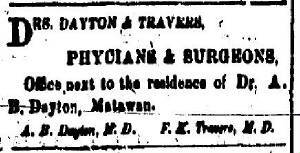 Dr. Travers was a Physician in joint practice in town. 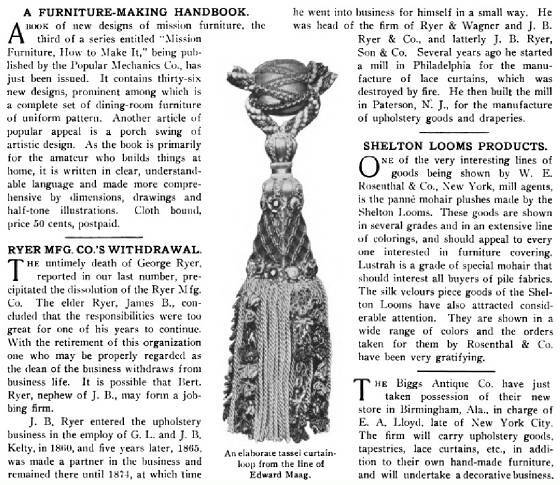 Below is his add in the Journal at the time. To the left is a detail from the famous 1873, Beers- Atlas of Monmouth County showing Thomas Ryer as the owner. In 1875 the Journal reported a harrowing accident for Thomas, then 65. Thomas had just pulled up to his son David's house in town when one of David's sons (perhaps Howard who would have his own mis-haps as related below) came out of the alley on a "velocipede" and startled the horses who then began to run. Thomas caught for the reigns and was dragged for a distance before letting go and was severley injured. To the right is a small item from the Journal of 1879 showing that there was even a cranberry bog on the property. In 1879 Thomas Ryer Sr. died leaving his wife Mary as owner of the Magnolia Farm. In general interest in Freneau diminished during the Ryer years, however as seen below in 1885 from Ellis' "History of Monmouth County New Jersey" the connection to the house property was still alive. Thomas Jr. appears to have assumed some of the management of the farm after his father died. He apparently fought and was wounded in the civil war as there is a record of him collecting an $8 pension for wounds to the abdomen. 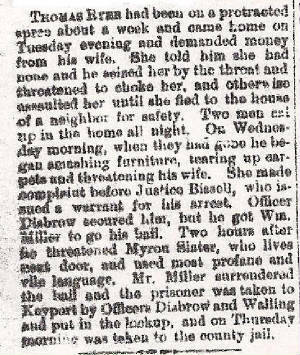 His troubles made the newspaper in 1889 in the Matawan Journal. Thomas and Louisa subsequently split with Thomas going to live with his brother James in New York and Louisa moving to Bayonne. 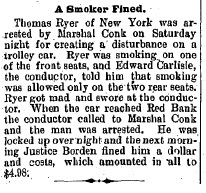 Even after moving to New York, Thomas was still causing trouble on his trips back to Jersey, below from 1902 Red Bank Register. Below, the 1889 Chester Wolverton, Monmouth County Atlas lists his mother, Mrs. M. Ryer as the owner of the property. In 1893, having owned the Magnolia Farm for half a century, Mary Ryer passed away at the age of 82. In 1895 James B. Ryer, the son of Thomas, took control of the property and the house he grew up in 50 years earlier, with grand plans and would turn the Magnolia Farm into his "country seat". James B Ryer's company was JB Ryer & Son and Co and was a big textile concern with offices and factories in New York, New Jersey, Pennsylvania, and Massachusetts. 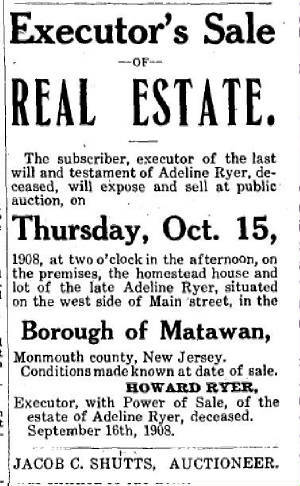 As shown in the front page Matawan Journal of November 16th, 1895 James B Ryer invested in a major renovation of the property. The rail line would have been added to to the north of the property (by today's Texas road) where the railroad crossed his land. 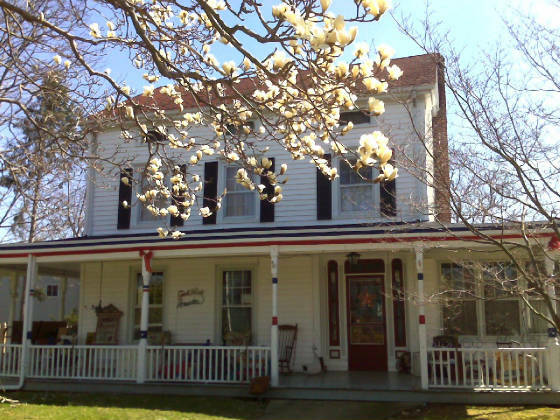 Along with running water and a bathroom, the other updates would have included the addition of the Victorian porch, and remodeling of the dormer servant quarters and master bedrooms. In addition to C. W. Lisk, the Journal reported the next month that Ryer had employed Henry A Young of Keyport to draft the plans for the remodel. H A Young was a prominent Keyport architect and builder. He designed the Keansburg elementary school, and St. Rose in freehold. 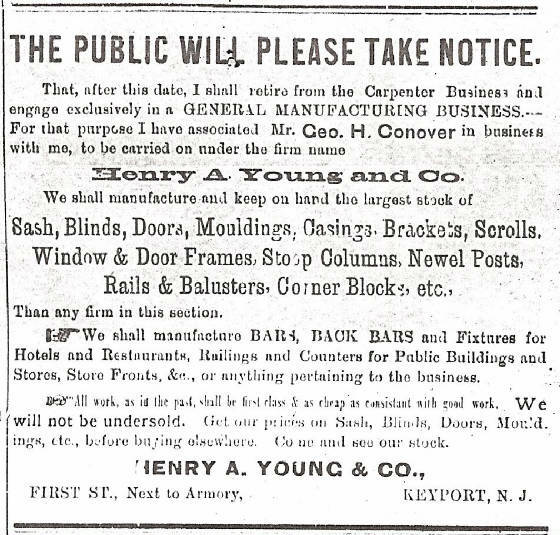 Below is an advertisement from the Keyport Enterprise of March of that year announcing that Young had entered into business with George Hance Conover. Note they will produce mill work sash, doors, and stoop posts. 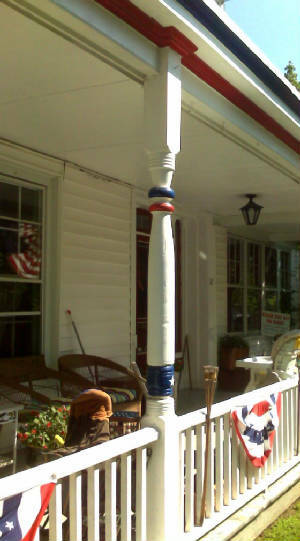 Therefore the striking and substantial porch posts (detailed at right), and double-dutch doors came from this company. Also note that the porch wrapped around to a carrage port on the north side of the house, and would have been put on AFTER the fireplace was removed. Accordingly it may be the case that Henry A Young was also responsible for the use of the metal beams reinforcing the great room. If so they would have been iron and quite unique for a Victorian (even a modern) home. The Journal article reported that Ryer had been over to the site that week "looking after the repairs now in progress"
The Redbank Register of December 11th, 1895 also covered the story stating that James B. Ryer was going to remodel the house for the new manager of the farm, David Buck. A short article a year later talked about the Buck's celebrating in their home. Apparently Buck taking the job coincided with his getting married. The farm had a number of managers during this time. 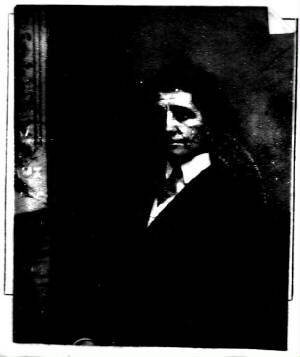 In August of 1901, the Journal reported that George Maghan succeded Edward Bendy as forman of the Magnolia Farm. Maghan was a brother in law of Thomas Ryer junior- both having married a Tully. Perhaps Thomas' terrible treatment of his wife may have partially influenced the decision to give George the job. As lamented in this article from April of 1897, during the Ryer tenure the connection with Freneau grew faint and his grave was neglected in the busy working Magnolia Farm. 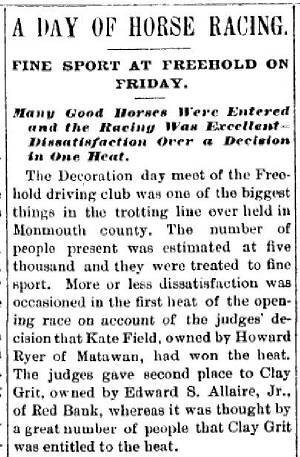 Below from the Register of August 24th, 1898 is an article about James B. Ryer taking first place at the Fifth Annual Horse Show of the Monmouth County Horse Show Association for "Addie W." one of the Magnolia Farm's horses. 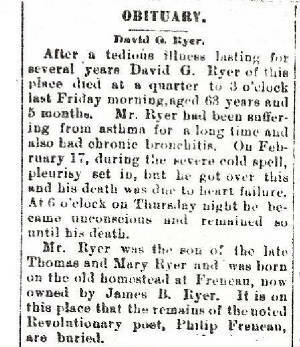 In 1899 David G. Ryer died. David was a prominant Matawan figure, who had taken over his father's business in New York and prospered further. 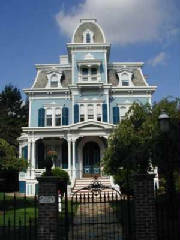 David built the famous blue victorian on main street. In the exerpt from the long obituary on him from the Matawan Journal it sites the Philip Freneau connection, but incorrectly states David was born on the property as we know from his age and the deeds that he was about 7 when his father moved there. David's widow Adelaide stayed in the Blue mansion. David had two sons and three daughters. One of David's sons, Howard continued the tradition of horsemanship as we see from the Redbank Register to the left documenting a little contraversie about a local race. Below we see how he was not having great luck with cars either, in a reference to a visit to the Magnolia Farm, maybe to show off his automobile with less than impressive results. He wasn't deterred too long from motoring, however, as we read a couple of years later about his new purchase. 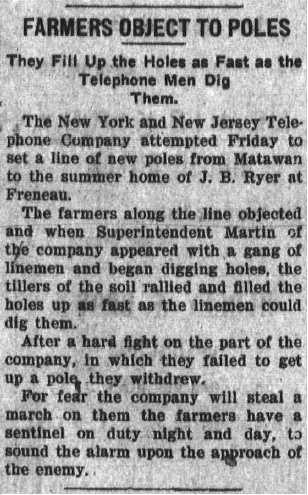 Here we see (from the Long Branch Record in 1902) the first attempt to bring the telephone to the house being thwarted by militant farmers. In 1908 after the death of his mother Adelaide, Howard auctioned off the famous Blue mansion and moved to Red Bank. In this snippet from 1908 to the right, we see Matawan becoming a bedroom community with James B commuting daily into the city in a scene that hasn't change for a hundred years. 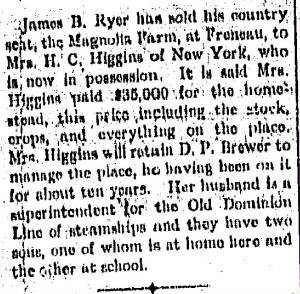 After nearly 70 years, the Ryer tenure finally ends when James B Ryer sells the Magnolia Farm to Mrs. H. C Higgins. Mrs. Higgins was the mistress of a riding club in New York City. Her husband, Howard C Higgins, was a superitendent with the Old Dominion Line of steamships, and was evidently important as he testified before Senate Committees of maritime safety in the wake of the Titanic disaster. To the left is the announcement from the August 25th, 1910 edition of the Matawan Journal. Below is an article from the 1912 edition of "the Upholstere" that announces the retirement of J B ryer after the death of his son, and gives a brief bio. Below is the ancient Magnolia tree in front of my house. It may be 150 years old and so definitely dates from the Ryer days. You can see some of the iron bars and cabling that has been added over the years to preserve it. It is still beautiful when it blooms. Interest in Freneau, and the site, may have been increasing as this large article from 1910 indicates. Of my house, the article correctly states it was build by Freneau's daughter and husband, the Leadbeater's. The Higgins bought the farm for Mrs. Higgins (Bertha D) who was a Mistress of a riding school in the city. To the right is a picture of her during the time she owned the farm. It is from her application for a passport in 1916. Below ia an advertisement from the Redbank Register 1914, they are looking for some tennent farmers to take care of the place. 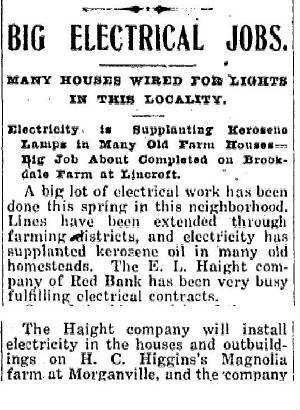 One notable improvement made during the short Higgins tenure, as seen in this excerpt from a 1912 Redbank Register article, the house was wired for electricity. This actually helps date the finishing of the upstairs dormers. Since the "tube and post" fittings are visible in the attic, attached to the beams which finished the ceiling in the dormers, it indicate that the dormers were finished before 1912, which would have been the 1895 re-model by James B. Ryer. H. C. Higgins, superintending engineer, Freneau, Monmouth County, N.J., telephone, 130W Matawan. It is significant because it shows a telephone was installed as early as 1915, perhaps when the power lines were run to the farm in 1912, or even earlier during the big renovation by James B Ryer in 1895. 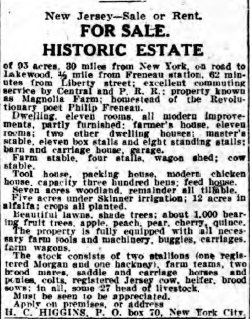 Below is a classified from the New York Times in 1915 advertising to rent the "beautifuly situated" home. The $50 rent is comparable to rents advertised for apartments in the city in the same paper. By 1917 Higgins was trying to sell the farm. Note, (to the right) it being advertised as an "Historic Estate". From Higgin's time on, sale of the historic home made the news. Below is the notice of the "Former Home of Philip Freneau" being exchanged farm to Fredrick Brown of New York for two appartment buildings in the city. Brown only held the property for a short time. Below is an adverticement for an auction held to clean out the place for the new residents. 1 Secondary sources are Philip M. Marsh who wrote multiple books and articles on Freneau including "Philip Freneau Poet and Journalist" and a number of articles for the proceedings of the New Jersey Historical Society including "Freneau's Last Home" in the April, 1939 volume; Lewis Leary who multiple books including"That Rascal freneau- A Study in Literary Failure", and also contributed articles to the New Jersey Historical Society including Philip Freneau and Monmouth County for the July 1948 volume; Mary Austin's "Philip Freneau- The Poet of the Revolution"; the WPA writers "New Jersey- A Guide to its Present and Past, 1939; New Aberdeen or the Scotch Settlment of Monmouth County New Jersey, James Steen 1899; Matawan 1686 - 1936, Written and Illustrated by the Federal Writers Projects, 1939; Documents relating to the Colonial History of the State of New Jersey, V 21; Evert A Duyckinck and others. 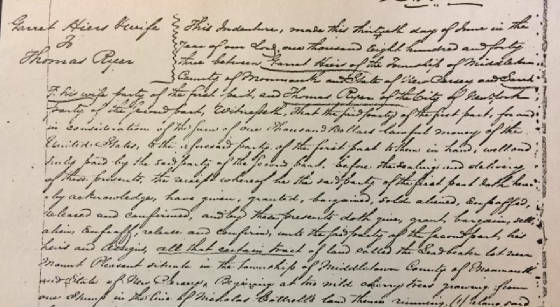 Primary sources include images of the Freneau family bible, John Hammels notebook at the from the Monmouth County Historical Association Freneau Collection, deeds, newspapers especially the Red Bank Register, Matawan Journal and New York Times, and other historical documents.